Whitney Whitaker has a job to do and knows how to do it. For the past few years, she has been developing her skills and abilities while working as a property manager and carpenter and studying for her real estate license. Now, knocking on the beautifully made iron Celtic Green Man at the rental house the students shared but had not been paying their rent on, Whitney waited for an answer. Too bad, but no rent, no stay and she proceeds to tell the layabout students they are out. They are not happy and neither is she as she notices how they have wrecked and trashed the small cottage. Later, as she tells Rick Dunaway, the owner about the damage, he surprises her and makes her a deal she finds too hard to resist. Whitney has always longed to get in the house flipping business and this seems to be the opportunity she craves. With her knowledge of construction and house repairs, she knows she can nail this. A call to her cousin Buck confirms that and they agree to do a deal together! Whitney is over the moon until problems, small and large start rolling in. They just keep rolling in, one after the other, until their house flipping plan ends up in the red.... blood that is. Even worse, the freshly appointed new Detective Collin Flynn of the Nashville Police believes Whitney is the whodunit! Can this former good as gold scout end up in jail for a ruthless murder? 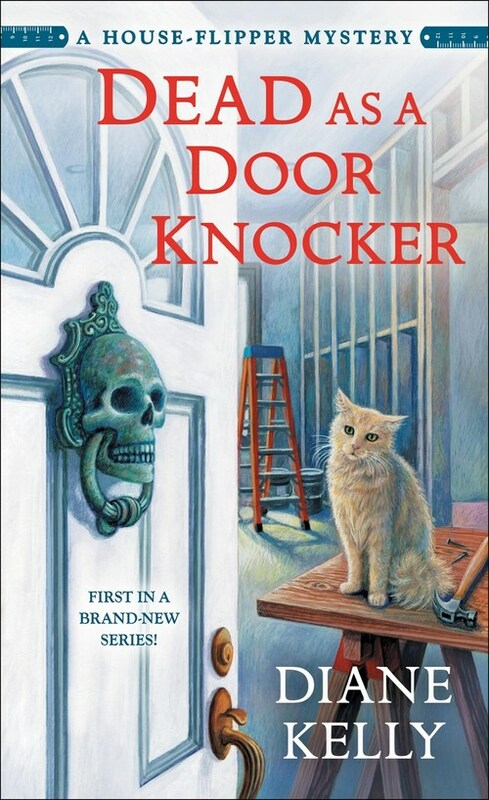 DEAD AS A DOOR KNOCKER is the first book in Diane Kelly's new House-Flipper cozy mystery series. Already well-known for her humourous and witty Death and Taxes and Paw Enforcement PAWS series of mysteries, Kelly is definitely off to a great start with DEAD AS A DOOR KNOCKER starring the intrepid Whitney Whitaker and Sawdust, her charmer of a cat, who adds in delightful or cranky commentary when her naps are interrupted. While DEAD AS A DOOR KNOCKER can easily be read as a stand-alone mystery, I am, as I am sure Kelly's many fans are as well, looking forward to number two in this new House-Flipper mystery series. Kelly is well known for her inventive plots, great character development and terrific female protagonists and her latest, DEAD AS A DOOR KNOCKER with Whitney Whitaker and Sawdust and their great circle of friends and family will only add to Kelly's reputation. I also like the potential spark of possible romance between the cousin Buck and Colette, Whitney's chef friend who is knowledgeable in kitchen design. Maybe, more visits between the handsome detective Flynn and Whitney as she eyes more real estate with potential? So, if you like reading about house flipping and intriguing mysteries (and who doesn't), you are sure to enjoy DEAD AS A DOOR KNOCKER and find out why a real estate dream turns into a nightmare!